Lee Iacocca from Ford Motor Company had said that Ford cars were good solid cars but they lacked ‘pizzazz’. So, in March 1963, Ford decided to go racing to ‘earn’ a better image, and to them the best way to do this was to win endurance races, especially the Le Mans 24-hour endurance race. Ford embarked on a ‘Total Performance’ program, which included the short cut in buying Ferrari. Ironically, Ferrari had made approaches to Ford earlier that year but due to the size of the company the word had not reached the appropriate department. Enzo Ferrari therefore was quite receptive to an offer made by Iacocca. However, after being overwhelmed by Ford personnel taking inventory of Ferrari’s assets, Enzo realized that he would not be able to work under such a large company, and called off the negotiations. Ford then decided to go it alone. Knowing that the expertise to build their own car lay in England, Ford sent off a scouting party (via Le Mans to see what was needed), which included Roy Lunn, Ray Geddes and Carol Shelby. They made an approach to Eric Broadley as his Lola car was close to the design Ford was thinking of and it was using a Ford engine as well. A deal was struck and Broadley was placed on a one-year contract and two of his cars purchased for development work. John Wyer, the team manager for Aston Martin in 1959, was also hired to repeat the success that he had had with the victorious Aston Martin DBR/1 previously. John would also be responsible for production of racecars and the eventual road cars for Ford. A new purpose-built facility was constructed in Slough, near Heathrow airport. This facility was named Ford Advance Vehicles and the first prototype was wheeled out at an official press launch on 1 April 1964. 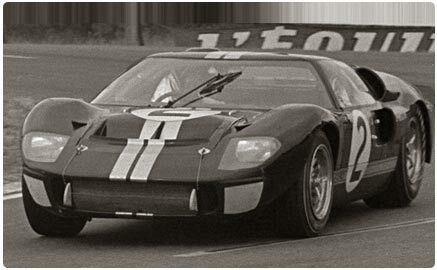 For 1966, Ford used the 427ci engine in a Mark 2 car and were at last successful at Le Mans achieving 1st, 2nd and 3rd place, after winning at Daytona again and winning at Sebring and other races that year. The car was totally redesigned for 1967 using the same big block engine but with a new Mark 4 body. Once again the Ford cars managed a 1st and 4th place at Le Mans together with many other race wins. In 1968, the Gulf Oil Company decided to sponsor the original GT40 design (Mk.1) using the 302ci (5.0 L) engine and the new ZF transaxles. John Wyer once again managed the racing team and produced wins and places at races all over the world including the record breaking win at Le Mans for both 1968 and 1969 using the same car (Chassis 1075) in the distinctive pale blue and orange Gulf colours. Oliver and Ickx were the drivers and Jackie Ickx still considers the 1969 Le Mans race, his greatest race of all. The road car version of the Mark 1 is among the five or six road cars ever to attain a top speed of over 200mph (320Kmh) and its popularity is shown by the many replica models found today in most countries of the world.